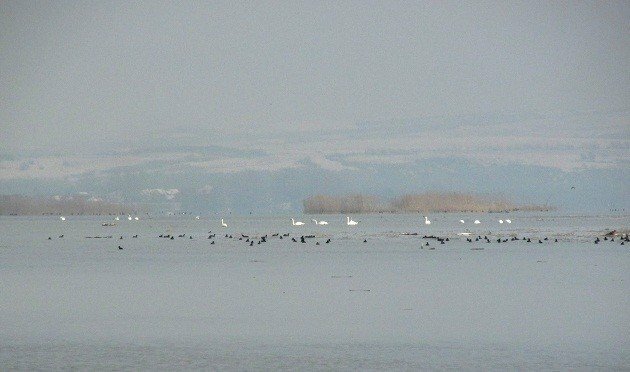 At the snowy Danube riverbank, we are waiting for geese to come to their roost inside the mostly submerged island. It is a January afternoon and several degrees below freezing. In front of us, the river is two miles wide… and it is paved with birds: smaller groups of Greater White-fronted and Greylag Geese, numerous Mute Swans and Mallards, plus Eurasian Teals, Gadwalls, Common Pochards, a few Ferruginous and Tufted Ducks, Common Goldeneyes and several Smews. Also, Little and Great Crested Grebes, Pygmy and Great Cormorants, Eurasian Coots and Common Moorhens, Black-headed and Caspian Gulls… And a lot more birds further in the background. A shot or two coming from the opposite bank, but they do not sound like geese shooting – more like boar hunting. A goose hunt sounds like a WWII battle. Still, there is a group of British birders helping us with the International Waterbird Count at that bank. 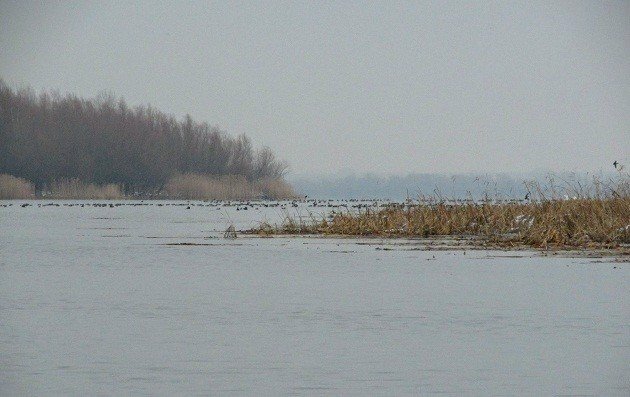 This section of the river is known as the Labudovo okno reserve, a Ramsar site and the most important waterbird wintering area in the whole of Serbia. A flock of small birds at the dyke, Yellowhammers mostly… I cannot see well because of one enthusiastic hunting dog which takes pleasure in running through the snow and flushing them up whenever the birds land. In flight, I can see white rumps of Bramblings, but the light is poor and I do not see any Common Chaffinches (and I never seen a wintering flock of Bramblings without at least some Chaffinches among them). Scanning the water for rarer species… S. warns me of two locally rare Bean Geese. I am checking for darker heads and necks, but the sunset is taking over… “How do you manage to tell them apart,” I ask him. “Watch for the dark beaks.” Yeah, right. In this light, all beaks are dark! 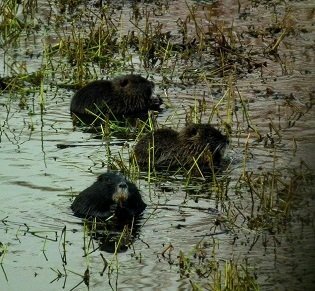 The only mammals of the day were feral Nutrias (Coypus), aquatic rodents originally from southern South America released from the bankrupt fur-farms and well established here. We counted more than 35 of them, relaxed and fearless, clearly not hunted. The secret of their success, beside the wide Danube, lies in a coal power station a few miles upriver, releasing its cooling water and warming up the shallows. All ponds and canals are frozen solid by now, but these shallow waters offer a perfect habitat for Nutrias. Checking the flocks of gulls on the water for a possible Lesser Black-backed through tears… yes, I can barely focus my scope through tears. But, this is Balkans, dear readers, and men here do not cry. It is the light, but bitterly cold northern breeze. And nope, no LBBGs. Geese from the inside of the submerged, horseshoe shaped island take flight, flushed by one young White-tailed Eagle. Almost as on a signal, the first flocks start arriving. While on bright days it is quite possible to tell the Greater White-fronted from Greylag Geese from a mile away, in the fading light of a winter sunset, one can only count on their voices, the higher-pitched honking of Greater White-fronted and the more nasal cackling of Greylags. An hour and 20,000+ geese later, we head back. In the dark, a few poachers are waiting by the dyke, dressed in white snow camo jackets, including the owner of that bird-flushing dog. How can I call them all poachers? Easy – it is forbidden to hunt at night. They were probably waiting for us to leave. The British group at the opposite bank has counted almost ten thousand geese (there were four groups of birders encircling the area), but their best bird of the day remains an Ural Owl, on a sign post by the road. Enjoy your winter temperatures, our winter here in Germany is ridiculously warm, cloudy and wet! Not fun!